Here’s a close-up of Marisa waiting to be awakened. Here’s everything that came in the box. From the left, the dollfie dream sister body, wig, a Dollfie Dream booklet (still the old Dollfie Dream booklet, no DDS content) and a simple sheet listing all the items. Clothing and shoes, and to the right most is Marisa’s broom. I’m just opening the box and taking a few quick shot, so a few quick observation with this new Dollfie Dream Sister body. A lot of the joints are much more flexible now on this new body. Arms can in fact reach to her back and her hand can touch the back of her neck, that’s pretty amazing. The double jointed elbow is a good compromise allowing more freedom in posing her without making that particular joint too ugly. After all the elbow joint is more likely to be not covered than leg joints. The new leg joints allowed much more freedom and soft vinyl still make sure the joint doesn’t look too ugly when rotated. The neck is very soft and flexible allowing you to bend with significantly increased range, but the range the neck joint will hold the pose is still somewhat limited. Overall, the doll’s joints are much stronger so she does stands better than the Dollfie Dream dolls. But her foot/ankle joint has proven to be the weakest link and she still falls due to the fact that her ankle joint is not tight enough to resist movement. Lastly, it seems that hand parts goes on and off a lot easier than Dollfie Dream dolls. I haven’t compared what the difference but I’m assuming they made the stub that hand goes on slightly smaller. Looking at the close-up. Those double joints on the elbows are a bit uglier than those found on Dollfie Dream dolls, but a good balance between flexibility of posing and aesthetics. And from the outside angle, the elbow joint doesn’t look all that different than the Dollfie Dream dolls. Marisa is so sweet, don’t you think? Now Marisa came with a set of hand that’s holding a fist. So I had to use my other hand parts purchased before for Dollfie Dream dolls for the rest of the shoot. I’m surprised that she didn’t come with a hand that can grab her broom. After all that’s her cover shot. Volks, that’s not really good packaging. 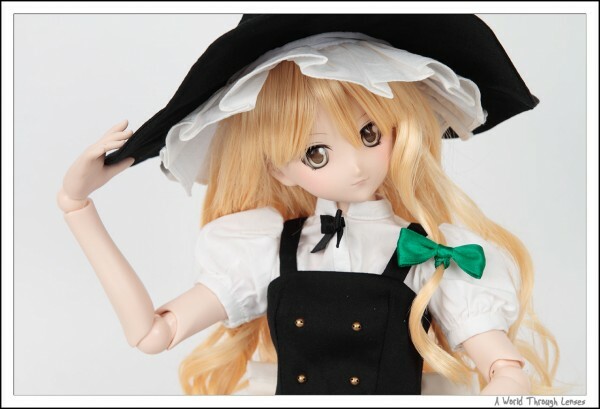 I might be okay with it since I have a lot of spare hand parts from my other dolls, first time buyers will definitely be disappointed that they can’t pose Marisa with her broom without first get some additional hard parts. In fact even I would rather have the grabbing hand as the default set of hand. Anyway, here she is with her witch’s hat and her broom. Here’s a pose that was previously not possible with Dollfie Dream dolls. Dollfie Dream Sister’s leg can be posed sitting down flat on the ground in an “M” shape. With Dollfie Dream, you can’t do this and with Mini Dollfie Dream, you had to pull their leg joints out so significantly that I consider it being very ugly. Now, with Dollfie Dream Sister this pose is finally achievable. 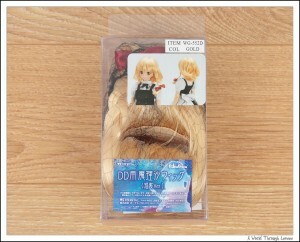 Together with Marisa, I’ve also got the Touhou Accessories Set, and Marisa’s short wig. I opened up the Touhou Accessories Set. 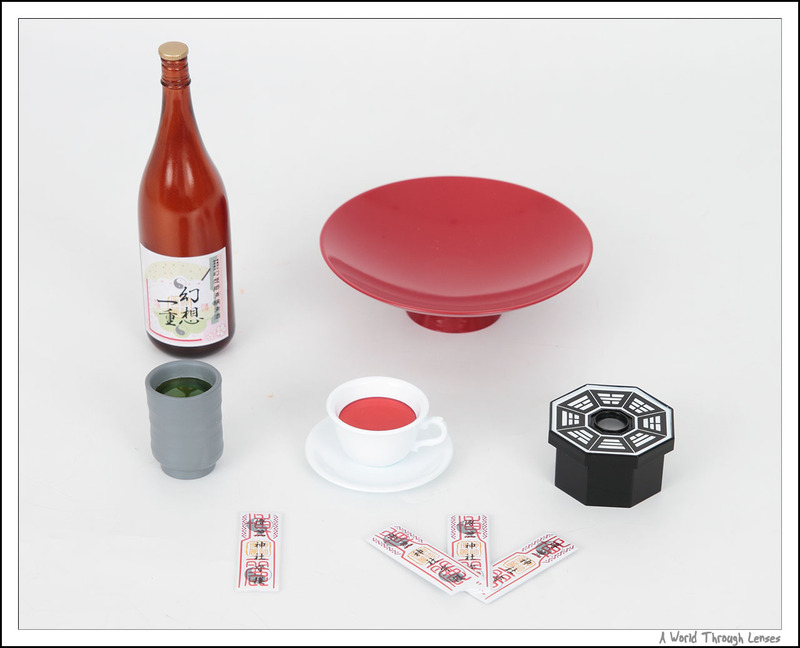 The set consists of the sake bottle, the sake cup, the green tea cup, china cup and saucer, Marisa’s Hakkero, and a single talisman and a three talisman set. They are all very nicely done. 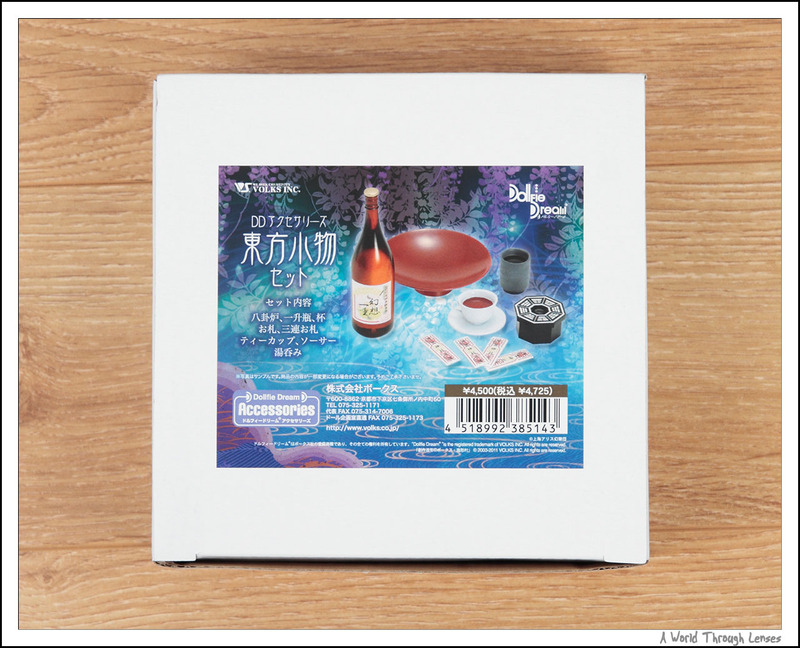 I really like that sake bottle and the sake cup. I will definitely put them to good uses in future posts. I conclude this quick post with a shot of Marisa together with my nendoroid Marisa. 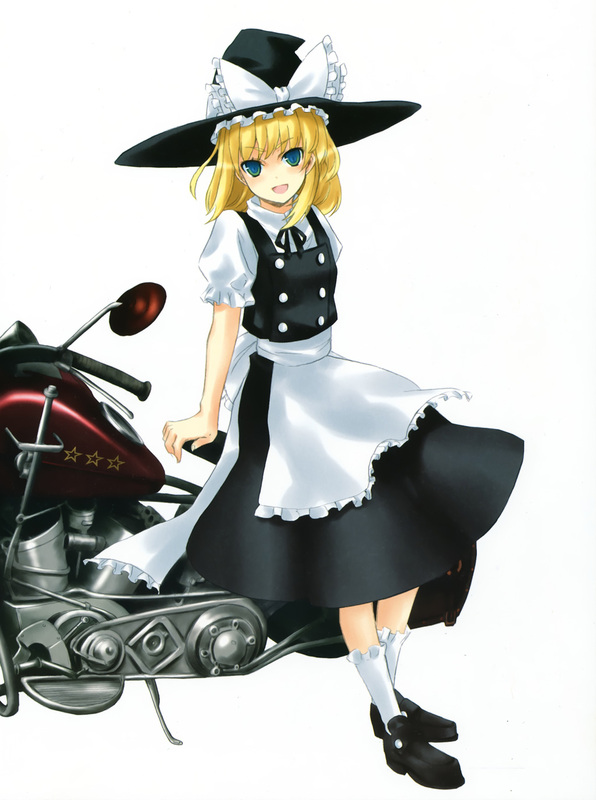 Here’s a 2D illustration of Kirisame Marisa. Didn’t order a Touhou DD when they were announced so splurged on a DDS (body only) on Yahoo! Japan Auction. Hope it gets here soon. Yeah it would be great to get just a body since head and all the other parts are compatible with DD2. 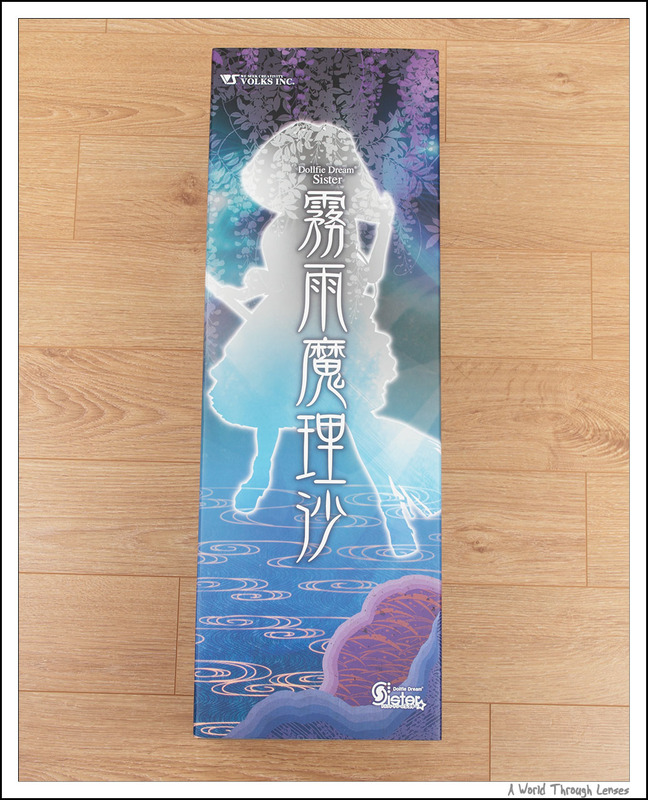 Well Marisa is for domestic Japan release only and not for international release. So I guess the way to get it now is to learn how to use a proxy service to access Yahoo Japan Auction service if you don’t already know. 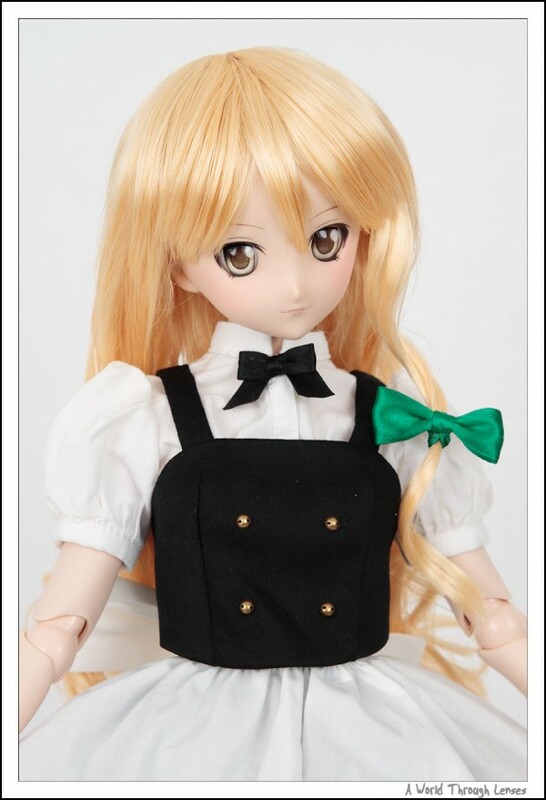 Then you can just bid on the doll on Yahoo Japan Auction. 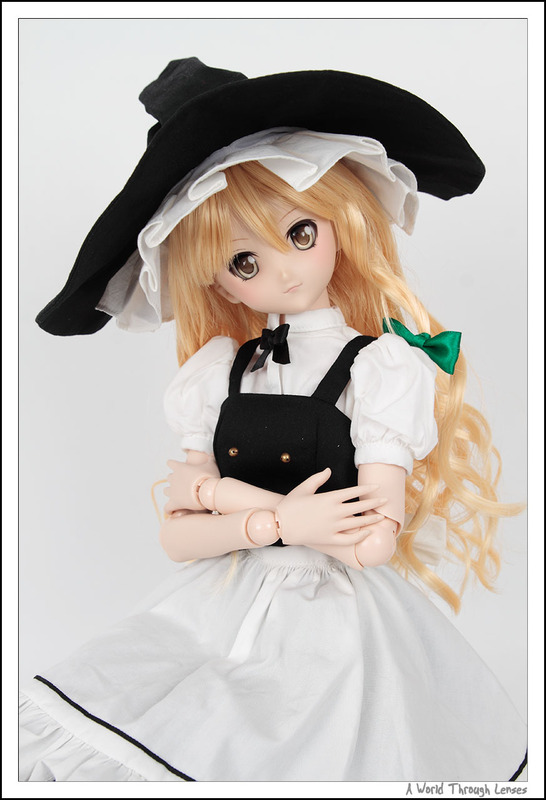 If you need a search link, here’s a search link on Yahoo Japan Auction for Kirisame Marisa. Keep in mind the page is in Japanese and you have to use a proxy service to buy these since the seller there will most likely only take bank wires in Japan and only ship inside Japan.